The freezer feels like it's filling up pretty fast this year. Part of that is the 75 pounds of chicken meat we added this and last week, plus the gallons of chicken broth from feet and necks of all the birds and from carcasses of the seven we parted out. The broth will be thawed back out in a month or two to form the base of tomato and vegetable soup, but right now the liquid takes up quite a bit of space. Strawberry season this year was a bit shorter and smaller than previously since frost got some of the earliest flowers and then rain this week caused other berries to rot. It's hard to complain, though, when we have over a gallon each of strawberry leather and strawberry freezer jam to perk up our late winter doldrums next year. 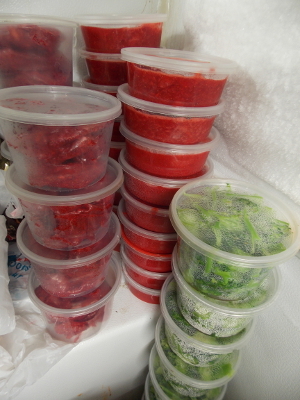 The only newly-frozen food that counts toward my goal of thirty-or-so gallons of stockpiled vegetables is the broccoli --- nearly a gallon put away so far. We didn't have enough broccoli to freeze last spring and our fall crop bombed, so it's exciting to be able to gorge and still freeze quite a few of the cruciferous buds. Although rain rots the strawberries, I was glad of a rainy afternoon since it let me work in the kitchen without burning up. 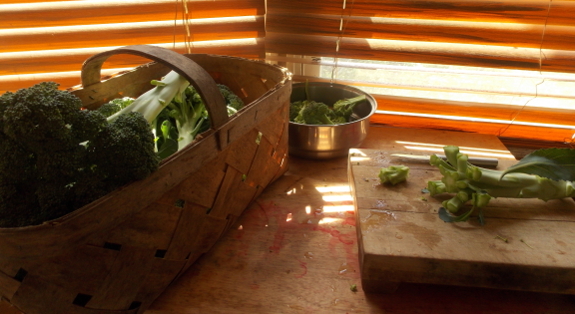 If it's too wet to be in the garden, you can always spend that time preserving the bounty! Broth from feet, etc. So what is your formula and how do you prepare feet, heads and other parts, please. What parts do you avoid. Why. It is supposed to be very tasty. Never made it. Also your comment on yellow fat in birds was VERY interesting. Do they taste better? More fat soluble vitamins, etc.? John ---- Here's my stock "recipe." (Although calling it a recipe instead of a method is rather bold of me since there's only one ingredient --- chicken.) You may also be interested in this post with tips from Harvey Ussery on which parts of the chicken to use and how to prepare feet. Yellow fat happens with pastured birds, and since omega-3s also happen with pastured birds, I've always assumed the yellow color is linked to those good fats. I'm not positive, though, since I haven't researched it. Luann --- I get this question a lot, but unfortunately don't have a good answer. Mark's mother hooks us up with our containers, and I think she gets them from a restaurant supply store outside Dayton, Ohio. I guess, barring a perfect mother-in-law, you could try restaurant supply stores. Do you two blanch your veggies before freezing? I froze homegrown green beans last year (blanched first), and found the texture awful once thawed and cooked. Just rubbery and squishy. Kinda like frozen and thawed fruit--never the same as fresh of course. But frozen and then cooked green beans from the store are so much better in texture than are my homey beans. What's your experience with your frozen veggies? jen --- I do blanch before freezing, but the results are still never as good as fresh. (Better than canned, though.) It's been so long since I've had frozen vegetables from the store that I can't really compare mine to theirs, but I can say that I often spice up frozen vegetables by sauteing with garlic (especially green beans) or roasting with olive oil and salt and pepper (especially broccoli). I also freeze a lot of vegetables in mixed soup form, which thaws out great (with the slight exception of carrots and potatoes, which change texture).